The sinking of then-new luxury ocean liner the RMS Titanic on April 14, 1912 is one of the most famous disasters at sea. The tragic events have been dramatized numerous times, most famously with James Cameron’s 1997 epic Titanic. With then-state-of-the-art special effects at his disposal, he attempted to make the definitive depiction of how the mighty ship sank. However, in the process, he sacrificed the humanity in favor of a melodramatic love story and elements of the thriller genre. The lesser-known A Night to Remember (1958) eschews these generic conventions in favor of historical realism. Based on Walter Lord’s 1955 book of the same name, the film was written by Eric Ambler and directed by Roy Ward Baker, both of whom had cut their teeth on documentaries and feature films during World War II. They applied their shared experiences and expertise to A Night to Remember and created one of the best depictions of the Titanic sinking. The first thing that strikes you is the economic storytelling as in first the ten minutes, we meet several passengers from various social classes and witness the launch of the Titanic achieved through a clever mix of stock and recreated footage. Once the action shifts to the passengers on the ship itself, Baker cuts back and forth from the wealthy upper class on the top decks to the poor but proud lower class far below with the former enjoying a swanky dinner full of pretension while the latter bond over folk music and singing. All the while the crew of the Titanic dutifully goes about their various jobs. A Night to Remember makes a point of drawing our attention to the oversights and mistakes key crew members and those of neighboring vessels made early on in the voyage without passing judgment but one can’t help but wonder how different things might’ve been had these early warnings been heeded. It wasn’t simply one big mistake that led to the ship sinking but several little ones that added up to disaster. 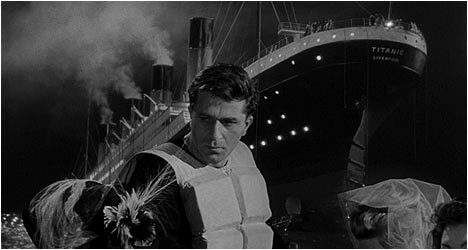 Once the ship hits the iceberg, the rest of the film plays out the sinking of the ship as we see the captain resolve himself to the inevitable and his crew efficiently spring into action but a creeping dread gradually builds as we know what’s going to happen. Baker expertly allows the drama to play out both below and above decks as many upper class passengers refuse to believe that the “unsinkable” ship is going down while the lower class people are denied access to the lifeboats. Meanwhile, the crew tries in vain to slow the advance of flooding sea water. Miraculously, even though Ambler’s screenplay is given very little screen-time to establish and develop such a large and diverse cast of characters, with the help of the talented cast it is able to avoid stereotypes and get you to care about what happens to many of them. Therein lies one of the primary strengths of A Night to Remember – the refusal to sacrifice substance for style because the story is dramatic enough that it doesn’t need to be couched in the conventions of the thriller or the star-crossed love story. They are merely distractions from the film’s focus – the Titanic. This film is a sobering reminder of the hubris of man and his technological achievements. It plays out like a cautionary tale told with consummate skill and excellent attention to historical detail but not at the expense of the story or its characters. “Timeline” allows you to bookmark and jump to key moments in the film. There is an audio commentary by Don Lynch and Ken Marschali, author and illustrator of Titanic: An Illustrated History. As experts on the ship and the events surrounding it, they point out what is historically accurate and what dramatic license was taken by the filmmakers. The two men talk about when they first became interested in the Titanic. They also point out that the filmmakers did a lot of research in preparation for the film. This is an extremely informative track. “The Making of A Night to Remember” is an hour-long documentary with interviews with producer William MacQuitty and author Walter Lord. The former remembers when the actual ship was being built and what it a technological marvel it was at the time. The latter talks about how he first became interested in the Titanic and came to write a book about it. They take us through the creation of the film with plenty of anecdotes and also behind-the-scenes footage. “Eva Hart: Survivor” is an interview with a lady who recalls some of her experiences on the ship. It’s pretty incredible to hear first hand accounts from someone that was actually there. “En Natt Att Minnas” is a 30-minute Swedish documentary made in 1962. It relies on the film and Lord’s book for the bulk of its information while also featuring interviews with three people that survived the sinking. This is a good look at what happened from a European perspective. “The Iceberg that Sank the Titanic” is a 50-minute BBC documentary that examines the origins of the iceberg that caused the ship to sink. There is a photograph of the actual iceberg and underwater footage of the submerged ship. This program explains how icebergs are formed and why they are so dangerous to ships.